The masculine version of our Je Suis EuropÃƒÂ©en badge. 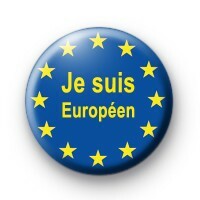 Pro Europe button badge in French. This is a Blue badge with yellow stars int he style of the patriotic EU flag. Standard badge made in our UK workshop.